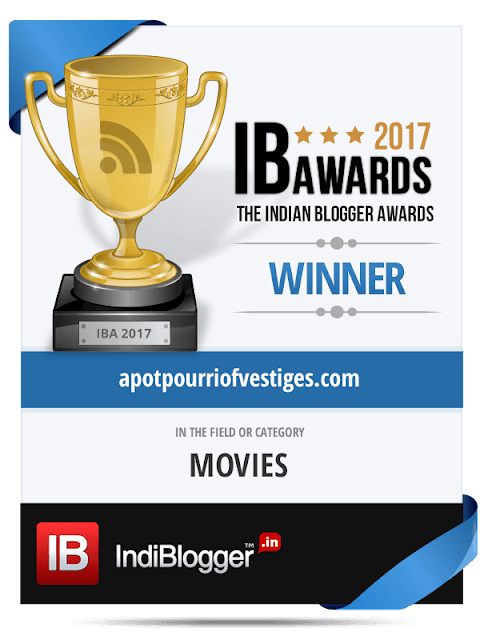 I am delighted to share with you that 'A Potpourri of Vestiges' has been awarded the best Movie blog at the Indian Blogger Awards 2017. I would like to take this opportunity to extend my deepest gratitude to the Indiblogger family as well as our readers across the globe. This is easily the biggest accolade that I have achieved in my 7 years of blogging. The fact that it has been chosen by an international jury (comprising Rochelle Maria Rao, Rashmi Bansal, Rajiv Makhni, Rajiv Dingra, Bibek Debroy, Kimberly Duran, Vijay Anand, Vinay Aravind, Kunal Daswani, Amit Agarwal, K.M. Ayappa, Jayant Sriram, Major, Indian Army, Quincy Larson, Kamla Ravikumar, Karun Chandhok, Anu & Tahaer, Judy Balan, Preeti Shenoy, Tanvi Shah, Mathivanan R, Sidin Vadukut, Rashmi Devaprasath, Tara Sharma, Anand D Jeyasekharan, Gul Panag, Shweta Raj Kanwar, Mallika Dutt, and Poonam Kaul) is an icing on the ice. I now hope to work even harder towards our ultimate goal of propagating the power of cinema to every nook and corner of the globe. In December 2017, TierraGamer included A Potpourri of Vestiges in their list of Top Popular Blogs. In November 2017, Movie Hustle included A Potpourri of Vestiges in their list of Top Movie Blogs. In October 2017, 'The Writer Awards' chose A Potpourri of Vestiges as one of the top entertainment and film blogs of 2017 (#8 in the Top 50) after carefully sifting through over 500 blogs from across the world. In July 2017, ITB included us in their Platinum List of Indian blogs, which is the Crème de la Crème of Indian English blogosphere. Indian top blogs (ITB) featured us in their eclectically chosen Directory of Best Indian Blogs for the sixth consecutive year in June 2017. Congrats Murtaza for winning the best Movie blog of the Indian Blogger Awards 2017!